Here ya go Tamiya collectors, coming soon is a Supreme edition of the legendary Hornet buggy. You see, Supreme is a esoteric urban design house based out of the NYC that is known for doing high-end collaborations with other companies (Nike, Fox Racing, etc). With the weight of the Supreme name, this Hornet just might become one of the most collectible of all time. And while we do not have street pricing for the Supreme Hornet, Supreme branded collaborations have been known to be incredibly pricey. However, Tamiya doing a collaboration with a brand like Supreme does a lot to get our hobby exposure, something we can never get enough of. What, no cow spots? No pink tires? Lame. Seriously, though, I will never understand this. The Hornet already has a brand - Tamiya. I don't know what Supreme is, and I can't find out, because the link won't work. But I imagine it's just some lucky idiots with a logo and enough marketing savvy (or good old fashioned con-artism) to make money by slapping said logo on anything and everything they think will sell. As someone who designs things for a living, calling them a "design house" is pretty insulting. Design is problem-solving. What problem is being solved by making an icon look like one of Guy Fieri's shirts? Have no clue what "Supreme" is. Their website is Garbage. But I'm all for Tamiya getting more mainstream exposure if that's what this is about. Curious as to how they will price this. "known for doing high-end collaborations﻿ with other companies"
If that's the case, a Hornet does not make a whole lot of sense. Supreme is a United States based fashion brand that was huge in Japan. I say was because I don't think they've been considered relevant for years now. Tamiya might be the lucky ones here. They probably got that logo for a bargain price, and this will undoubtedly help them sell Hornets in Japan, where collectors will eagerly throw money at any limited release that features a well-known brand. Shoe companies do this with massive success. I can see why Tamiya is having a go as well. Did you notice the entire logo design is basically lifted from Barbara Kruger's signature work? And I'll be honest, I'd almost rather they'd done a Guy Fieri shirt pattern instead. At least that would be a bit more mysterious. The Supreme logo basically just says "easy marketing exercise", and not much else.The Watanabe Hornet actually had a backstory involving the designer and his memories of the original. There was a visceral connection between the artist and the "art". Not so much with the Hornet Supreme. if it the same old hornet under neath then in my eyes there ain't nothing special about it at all. if tamiya are trying to fob us of with a brand name that most have never herd of and a flash paint job then i feel sorry for them. The Watanabe was awesome, creative and very well executed with passion. This is absolute trash imho, it doesn't even look good. The supreme logo looks cheap and nasty, like a supermarket own cut down brand name. The flames just look lazy, no thought or inspiration has gone into this, the only decent thing is the black wheels, ripped off the other limited models anyway. ...esp as twin set as said "this Hornet just might become one of the most collectible of all time"
Supreme was a skateshop. In recent years the fashion industry has decided skateboarding is the cool thing right now. Supreme jumped on the cash cow, and now they make ridiculously overpriced clothing to sell to "hipsters". As OCD said, it is very popular in Japan. 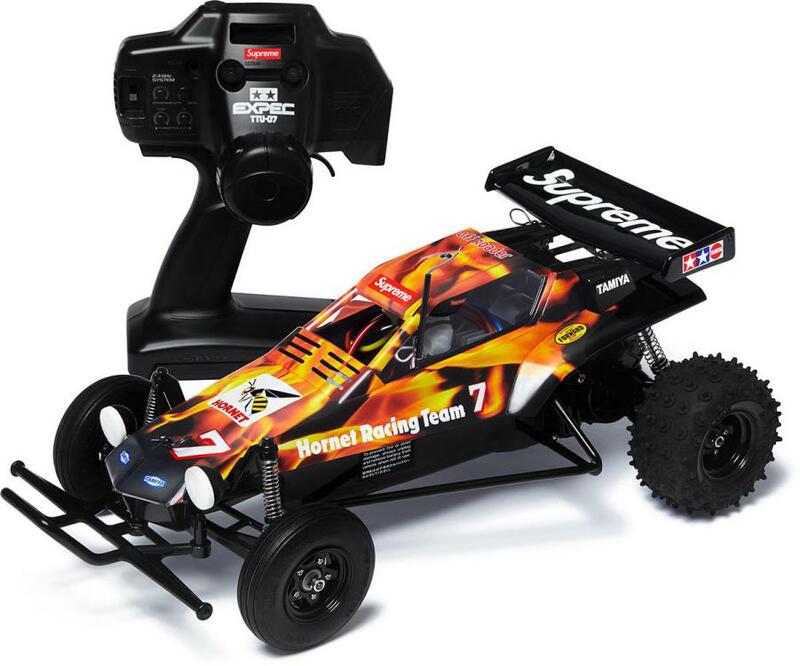 In the US, a kid wearing Supreme will not be driving an RC car. Supreme..... and still no ball bearings. In an XB. As someone who is significantly into sneaker collecting, I am intrigued by this. As unlikely as it seems I would love Tamiya to do a collab with the likes of Nike & Adidas. The concept on the face of it seems quite absurd but I think some really interesting ideas could come out of it. As long as this Supreme Hornet gets a price point the same as the other Hornets I am interested in this. And I doubt that Tamiya would allow the buggy to be priced above the likes of their Watanabe & Metallic Special versions of the Hornet as they have a brand image to protect. This isn't sneaker collecting where anything goes. And even in the sneaker game, the kicks that end up on the resell market for hundreds & thousands of dollars still only start out with a modest retail price from the actual manufacturer. I wondered what people on here would think of Supreme. A mate of mine at work is a big sneakerhead. He’s a few years younger than me and Supreme is one of his favourite brands. He regularly buys stuff on their ‘drops’ which run out in a few minutes. When I heard about it, I thought it was a good way of Tamiya being ‘current’ and appealing to another crowd that likes retro, re-res and NIBs. Agree. The sneaker scene is absolutely monster-huge and Tamiya getting involved in it could really give them some new-found street credibility with the younger generations. Like I say, it's an unlikley prospect but one that would be worth looking into IMO. Before this thread I had no knowledge of the Supreme brand, so I don't see it as a reason to go out and buy a Hornet. However I do like the looks of the flaming bodyshell, so if the price is right I would still be interested in this model, simply because to my eye it appeals aesthetically. I might buy one of these Supreme 🐝 just so I can bash it and therefore keep my own beautifully bodged/restored/thrown together Hornet for the shelf ( Watanabe chassis hacked as I messed up the steering servo area lol) without risk of damage... I’d have no issues jumping this Supreme off unrealistic scale drops if the price isn’t off putting. And XB... saves me building it, like I don’t have enough stuff queued already. No idea what the Supreme brand was till now and no doubt I will soon forget it too. I might be more inclined to buy it if the paint scheme included pepperoni, mushrooms, green/red peppers, onions, sausage and extra cheese. Sounds like the "food series" Hot Wheels cars that were out at one time! The two hobbies are incredibly similar. Enthusiasts congregate on dedicated forums and talk themselves into a frenzy about forthcoming releases. Retro releases are hugely popular and there is lots of dreamy-eyed reminiscing about days gone by. The main difference is the grotesque reselling that goes on and there is a distinct lack of community spirit. The whole scene is full of snakes and scammers and its skewed towards those who have various devices to gobble up all of the limited stuff. What's worse is that the manufacturers not only turn a blind eye to this, they actually want it to be like this as the crazy hype drives up the value of their brands. Cynical in the extreme. Yeah, I see all of the parallels... collecting has a distinct hallmark that is ever present, no matter the genre. I'm just amused that sneaker collectors have so much in common with something as dorky as hobby grade radio controlled models. Sneaker collecting just seems eminently "cooler" of a hobby and I can't imagine someone in a sneaker forum ever saying, "you know those Tamiya RC peeps sure have a lot in common with us"
The sneaker heads and the Supreme nuts definitely have some crossover. Other then Imelda Marcos, I can honestly say I've never heard of anyone collecting shoes as a hobby.